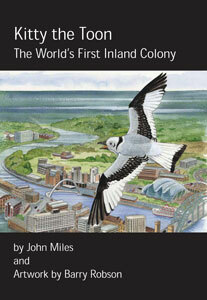 The story of the worlds first inland Kittiwake colony, especially written for children. Targetted at children aged 8-10. The story of Kitty is based in the city of Newcastle which is home to the first inland colony of the species in the world. The book follows Kitty and her family throughout the breeding season as they deal with all the challanges of life in the north-east of England. A lot of local landmarks are visisted throughout the story adding a large degree of realism. Ecological facts about the species add an informative aspect to the book.